This post is really more about the Guacamole than the Fajitas as we were just trying to use up some leftover Grilled Chicken plus everyone seems to really like my Guacamole. It's a recipe that started as my Mom's but I have evolved it over the years a bit and I honestly think she likes mine more than her own now... I figured this is a good time to post my Guacamole recipe so that people can hopefully enjoy it during the Super Bowl! I find that if you don't remove the seeds of the tomatoes it get can a bit too watery. I also insist on mashing mine up with just a fork instead of a food processor since the flavors remain more in tact and the consistency feels more natural to me. As long as the avocados aren't under-ripe, this should never be a problem. 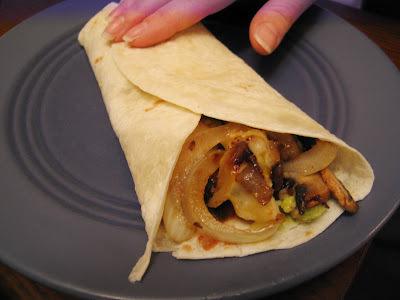 When it came time for my fajitas I just reheated my leftover grilled chicken with some sliced Pepper Jack cheese and then sauteed some mushrooms and onions. We also added some roasted garlic Green Mountain Gringo salsa, which is by far my favorite salsa. In the end we had a delicious meal that certainly didn't feel like leftovers. You should get a mojete to make your guacamole. I love mine because it provides the perfect surface area for preparing guacamole.